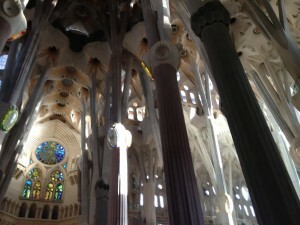 We recently visited Barcelona and came away liking it bunches. We got to spend three days there on our big-time, wondrous, splendiferous all-expenses-paid trip to the Iberian peninsula. Granted, we had to pay for all the expenses, but one can’t have everything. 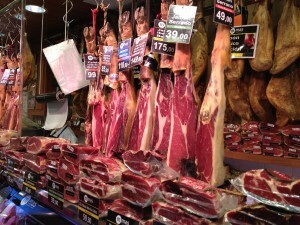 The only problem with starting a trip to Spain with Barcelona (besides paying for it) is that everything else is less. Not that Valencia, Cadiz and other locales in Spain aren’t quite nice, they are indeed, but Barcelona is a hard act to follow. First thing. If you do have the opportunity to go to Barcelona, don’t stay at the W Barcelona. We did, but really wished we hadn’t. This makes the second time in about a year that we’ve sampled the rather doubtful offerings of the W chain and we have come to the conclusion that the W is just not our cup of tea. Or glass of beer, in my case. The relentless drive to be hip, trendy and cool, is wearying and although I hate to admit it, Mary is probably quite correct that we are neither trendy nor hip. I’m still holding out, probably in vain, on the cool though. If I had to point at one specific factor that I think most detracts from the experience, other than the constant and unremitting music from bands I’ve never heard of and don’t particularly like, it’s the consistent incompetence of the staff. They are obviously hired for their youth and attractiveness, and the inability to perform the simplest of tasks, like totaling up a bar tab, is as far beyond their capabilities as is high-energy physics. Still they are pretty young things. Anyway, skipping any more probably libelous jottings about the W, we can consider the attractions of Barcelona. As a tour guide we hired reminded us, many times, Barcelona’s attachment to Spain is a lot more limited than Spain’s attachment to Barcelona. Barcelona and it’s surrounding environs, Catalonia, have suffered less from the current recession than the rest of Spain, and as a result would like to keep more of their tax revenues to distribute at home. Catalans apparently dream of a world where they were, if not independent once more, at least considerably more autonomous. And indeed, Catalonia would still be independent of Spain proper, if their rulers and armies were a little more proficient at the art of war. Sadly, Catalonia has a long and distinguished history of failing at the defending the realm game. Still they make a damn fine tortilla. Tortillas in Spain, or in this case, Catalonia, are not the thin disks of ground corn meal that are used to wrap delicious hunks of carne asada, but instead something similar to a frittata. Fun factoid for the day. We wandered about Barcelona for three days and would go back immediately if the opportunity arose. The city contains one of those wonderful old town areas with the narrow medieval streets winding higgedly-piggedly, a real delight if you don’t have to drive through it. Twentieth century warfare wasn’t especially destructive here, so lots of the original city plan is intact. Down each narrow alleyway there lurks an interesting cafe, or shop, and so exploration is fun and relatively risk free. As we were warned over and over, pickpockets are a scourge, but we never had any problems. 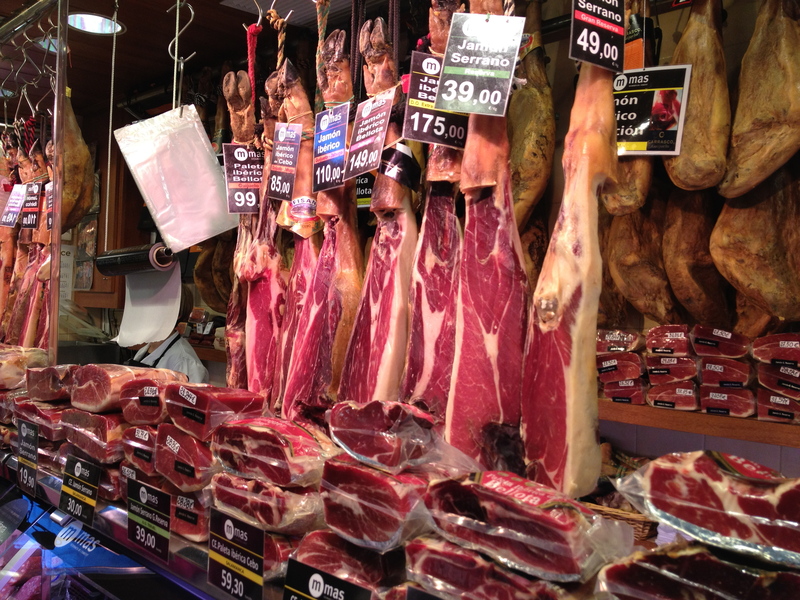 Another nice aspect of Barcelona, and one that endears it to Mary especially, are the markets. Each neighborhood has it’s own market and the selections are enough to make you wish you could settle down for three or four months, rent a little pied-a-terre, and cook and cook and cook with the wonderful looking produce and meat. Well, that’s Mary’s idea of what I should be doing with my time. In Barcelona, they don’t have tapas, well they have tapas, but they call them pinchos. Pinchos are almost always served on top of a piece of bread, even when there is no real reason to have a piece of bread along. 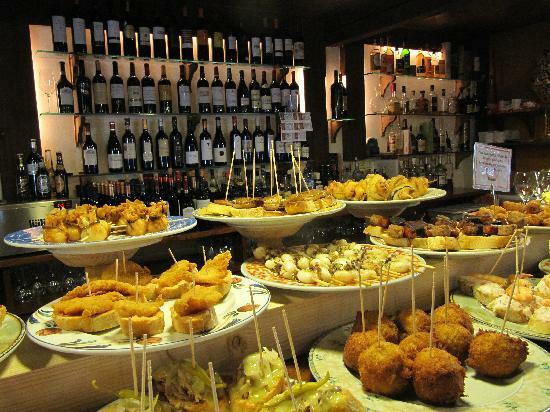 With the pinchos, one should have a glass or three of Txacoli, a white wine that is poured from a height of around three feet above the glass. This aerates the wine and gives it a little more oomph, which is what they say, but I think they really just like it as it makes for a bit of a spectacle. I’m reasonably sure there was some cultural stuff we did, because Mary would never pass up on an opportunity to experience culture. It’s kind of a blur since I tend to remain focused on the important things in life, and in Barcelona that would be pinchos and Txacoli. 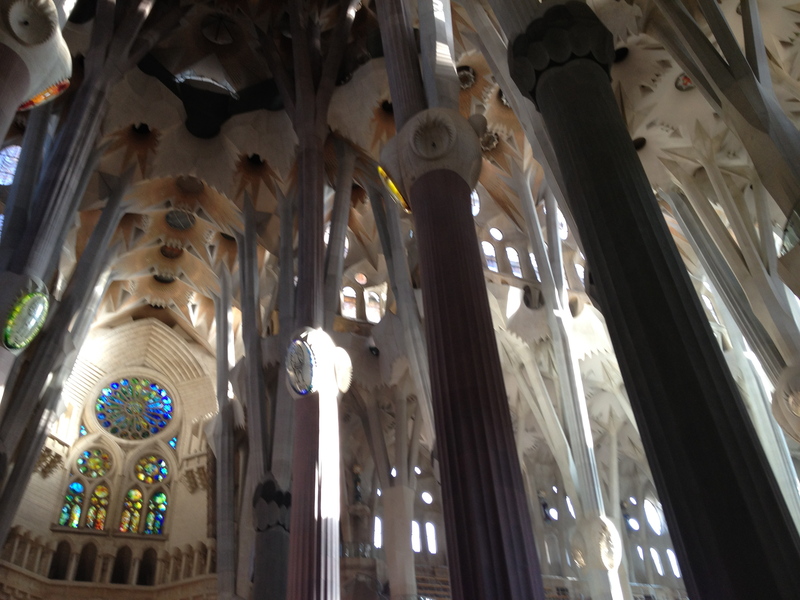 I believe there were some architectural highlights pertaining to Gaudi. Perhaps some museums too. While we were in town, the annual Christmas market was in full swing and that was pretty cool. It’s kind of cultural too, if you want to look at it that way. They have dozens of booths that sell all sorts of pieces to put in your own miniature Nativity scene (the kind that sits on a side table – not the life size ones that people with too much time on their hands set up in their front yards). This seems to be a big thing in Catalonia or maybe it’s just Barcelona. It was never quite clear. They have everything. The Three Wise men, carts, and wagons and foliage galore. Animals from far and wide since, well it was a stable after all, though I must confess a bit of surprise at seeing elephants and ostriches, for instance. Were they popular farm animals during the Roman Empire? And then there’s this little bit of Catalonian culture. As Mary remarked, Catalans have some decidedly strange ideas.